I just had to snap a photo of this snack from a roadside stand in Laos. It was somewhere between Luang Prabong and Vang Vien, to be specific. I’m not exactly sure what part of this is edible, but there they were, a couple trays full of them, all nicely bundled up. Unfortunately the photo is a bit blurry as I was trying not to attract attention and the glass case they were sitting in could certainly use a cleaning. 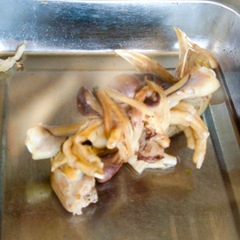 In case you can’t tell, what we have is a chicken head (with neck), some bigger chicken bones, and chicken feet all wrapped together with chicken tendons. That’s some prime chicken right there. This is one strange food that I was not even slightly interested in trying. This entry was posted in food, laos, southeast asia, travel and tagged food, laos, meat, southeast asia. Bookmark the permalink. Post a comment or leave a trackback: Trackback URL.